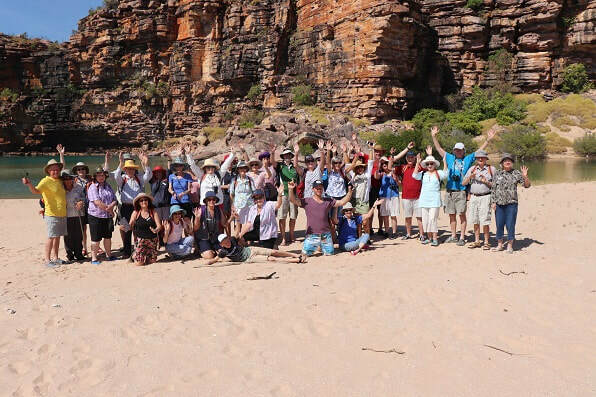 Michael Osborne retraces the ‘never to be forgotten’ time he explored the Kimberley Coast. 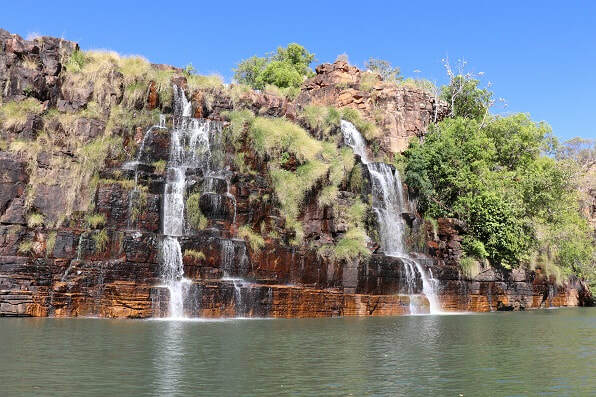 I am often asked as to what I would consider as some of the highlights of my 40-plus year as a publisher and travel writer/photographer – the one that always comes straight to mind is the Kimberley Coast. A trip once done in 2009, when we filmed it for our Foxtel show Travel TV. So when the invitation from Christian Fellowship Tours (CFT) arrived to cover their same trip, I answered in a heart-beat. CFT are Australian based family run tour operators. They offer faith based experiences and to have fun with like-minded people. They quote ‘Whatever holiday you choose you know that when you travel with other Christians you will find opportunities to really connect, form friendships and enjoy true fellowship’. The specially designed tour package has us arriving in Darwin to be met by the team at the airport and luggage soon transferred to the coach and our accommodation. Once the entire group arrive, we are hosted to an excellent smorgasbord group dinner. The first thing we note is that most of them already know each other, having travelled together before. This is obviously going to be a good tour! Darwin. We have the choice of being taken on a tour or, as we decided, to explore on our own. Darwin is only a small and very remote city, but it is amazing as to what there is to see and enjoy. For shopping and restaurants The Mall is the place to wander. If it’s markets then you must go to Mindil Markets, a legend for locals and tourists. Open between April and October, Thursday and Sunday. Disclaimer: Unfortunately, due to space limitations, this will have to be a condensed version. My report from nine years ago was over 4,000 words. Sailing Away. At the wharf the Coral Expeditions ship, Coral Explorer I is waiting. Our group of 42 are all very excited as we board and are shown to our small but comfortable cabins. Once clear of the harbour we set our course to the South-West and make for the Joseph Bonaparte Gulf. Sailing south along the coast, our first destination is Tranquil Bay and then the King George River. Passengers are quickly on deck, most trying to clear the head after a rough passage across the Gulf. Cameras and binoculars are front and centre at their first close-ups of this ancient coast. After lunch we board the Explorer, this wonderful tender that allows all passengers to walk straight on to it and then, like a giant forklift, to be lowered into the ocean and sail away. No balancing with the risk of a fall. A rapid trip along the river has us to the magnificent King George Falls, a towering 80 metre high, making them the highest in WA. 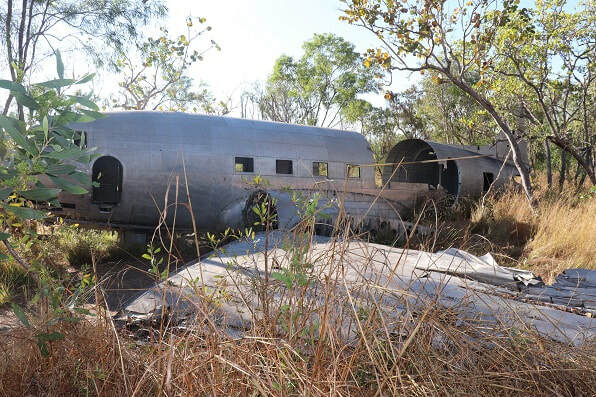 Next stop was Vansittart Bay where we go ashore to look at a WWII reminder, a USAF DC3 that ran out of fuel and made a successful crash landing. All on-board were eventually rescued. 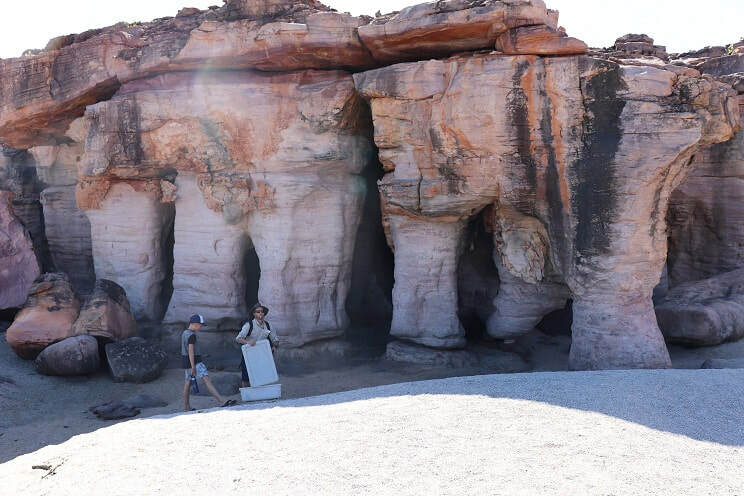 After lunch, it’s over to Jar Island to view Aboriginal Bradshaw and Giyorn Giyorn artwork that is at least 20,000 years old. 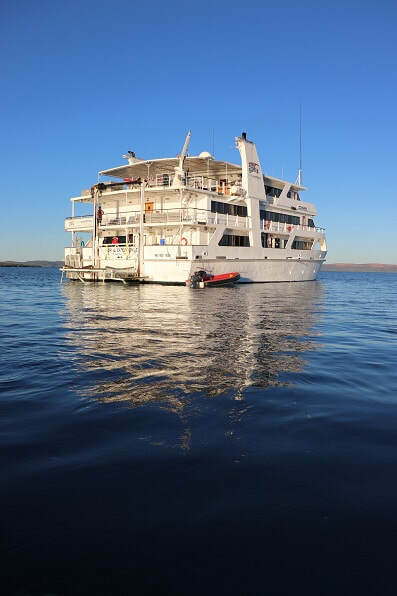 Day 4 and we sail to Swift Bay where we can go ashore for the optional Helicopter ride to Mitchell Falls, a highlight of a fantastic trip. After lunch it’s the magic Hathaway’s Hideaway where the wind and erosion have created a scene that would suit an Indigo Jones movie. The size of the shell middens indicate how popular this has been for many thousands of years. Day 5 and Prince Frederick Harbour. Off to explore and learn as we navigate the mangroves and enjoy the wildlife and the rock formations. We even stop the engines and soak-up the sounds of nature. Amazing! Day 6 and we are at Prince Regent River and Careening Bay. It gets better and better…. King Cascade, a spectacular fresh water event tumbling down from the escarpment. Many opt to go ashore to climb the path to the top and enjoy a swim in the crystal water. The rest sit back and enjoy as a croc swims past the tender. Careening Bay is where King beached the cutter HMS Mermaid in 1820 for very urgent repairs and his crew left some early graffiti carved into a Boab tree for us to see. Day 7. Raft Point and Steep Island. 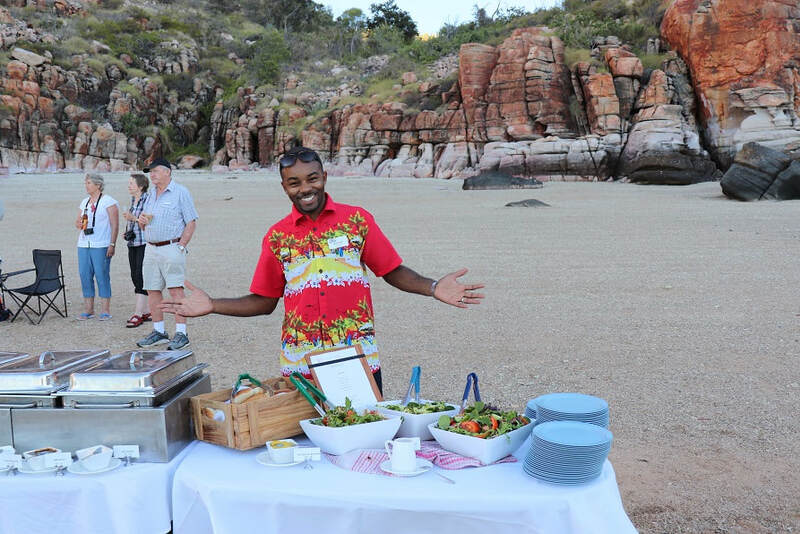 After breakfast it’s time to go ashore and meet the traditional owners, the Worrorra for a special viewing of the famous Wondjina Art site at Raft Point. Cruising around Steep Island we see a whale and her calf, who was obviously feeding, as they drifted along. 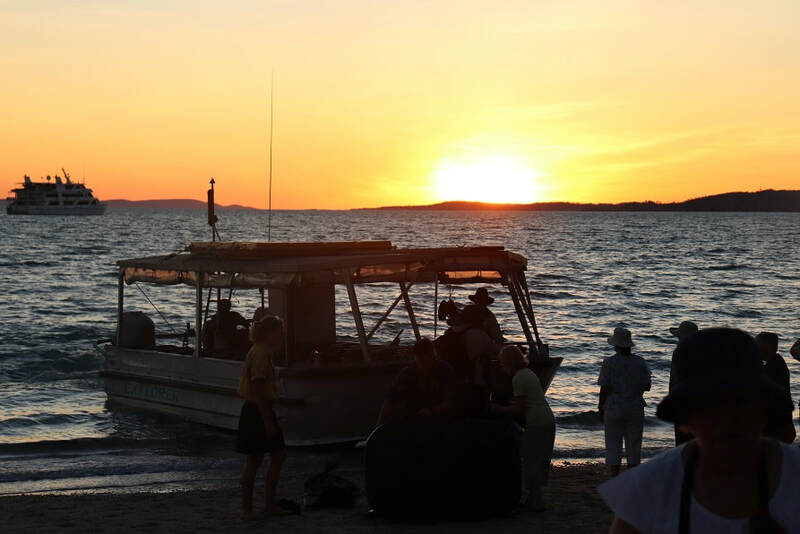 Tonight is the famous Coral Expeditions Beach BBQ, another fab feast as we watch the sunset over the water. Day 8.Red Cone Creek and Montgomery Reef. Scooting along in the Explorer, Red Cone Creek takes us to Ruby Falls, where those agile enough were able to safely scale a few rocks and enjoy a refreshing swim in the pools above the falls and the crocs. Montgomery Reef is around 25km x 13km and is often regarded as one of the natural wonders of the world. As the tide drops the reef appears to rise from the ocean. The zodiacs are waiting to take us into these rushing cascades. 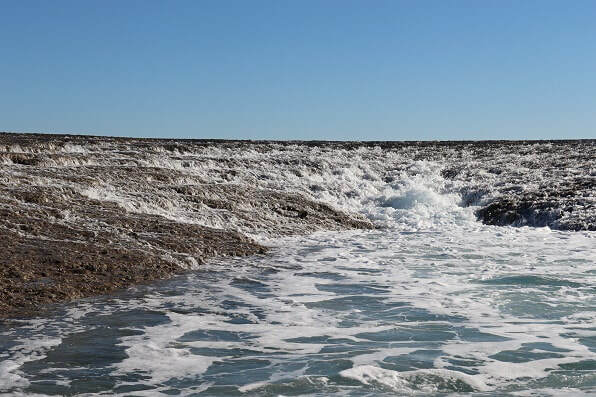 The huge tide, as it drops has to rush through a small opening, which creates a back-wash and causes a pressure zone giving the effect of a small waterfall for the zodiacs to enjoy. Ashore on Iron Island we are able to (try) and pick up some lumps of raw iron ore and wonder at the colours in the rocks and ore.
Day 10 and a private visit to Beagle Bay and the Centenary celebrations of their Sacred Heart Church. Day 11. And this wondrous trip is nearly over as we arrive in Broome. After a tour of Broome and a wonderful farewell dinner, a night’s sleep in a stationary bed, we are transferred to the airport. All up, I am so glad that I got the chance to return. Well done to all concerned.